It hurts our hearts a little to see the remnants of a beautiful cardstock page littered with cuts and holes that seem to render it unusable. It’s a crying shame. There’s so much paper leftover, and yet none at all! “Water, water, everywhere, nor any drop to drink.” (Thank you, Samuel Taylor Coleridge.) Potential appears to be squandered. Dreams run dry. Yet we still find ourselves clinging to these scraps, hoping someday we’ll find their purpose. And so we did! Want to see what we came up with? 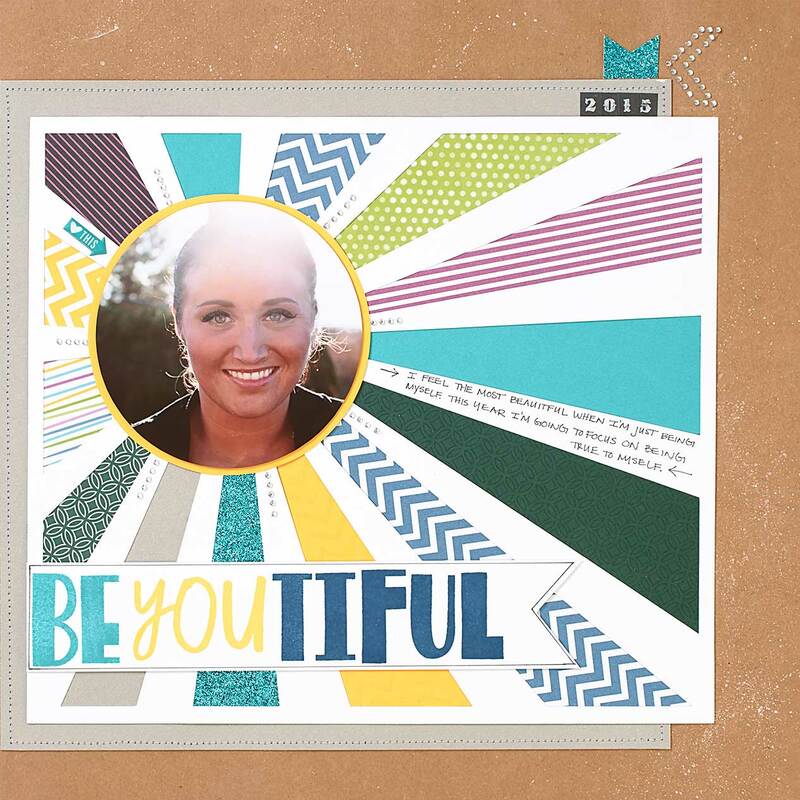 #1) THE LAYOUT This authentic and eye-catching layout is made with scraps from ELEVEN different papers! (Check the recipe at the end of this post to see which ones.) The best part about it is that, thanks to the Cricut® overlay, we only needed small scraps of the papers to weave into the layout. The different patterns and colors working as one make for a brilliant display that proves these paper scraps are better together than they ever were apart. The White Daisy ink splatters against the kraft cardstock. We love the way this adds texture and life to the spread, encompassing the repurposed and artful utilitarian nature of this layout. The way the journaling is seamlessly integrated into the flow of the layout. We’re just tickled over how the journaling blends so seamlessly with the layout that it’s become another artistic feature! It also adds a dose of personality and life to the layout. The creative use of the Sparkle chevron shapes. Did you notice that the lines of sparkles stemming from the photo are actually cut from Sparkle chevron shapes? Cool, right? Just one more example of how to use bits and pieces to create something beautiful. The scraps that are too small for layouts can be used on card designs. Cards are the ideal location for little bits of paper that can be pieced together in original designs. Thanks to Close To My Heart’s exclusive color palette, you can match papers and patterns across paper packets because the colors are consistent. The intricate weaving on the Hello Sunshine card was done with yellow- and white-based scraps from SEVEN different papers. If it’s possible to make this many patterns look good together, then it will surely be possible to make something visually appealing from blending your own scraps. Embellishments that add that finishing touch. Whether it’s the Flaxen extra thick twine, the teal Shimmer Trim, or the bling gems gold assortment, we love how those little glittery pieces of this and that provide the final bit of glam for these hodgepodge cards. Steady patterns that lend structure to the patchwork design. One way to balance out the discord from using scraps is to corral them into a simple and repetitive design, like those seen on these cards. It’s all about that yin and yang! Now it’s your turn to make something useful of those piles of scraps you have lying around. Once you start, we think you’ll come to realize that your usable paper stash just got a whole lot bigger!